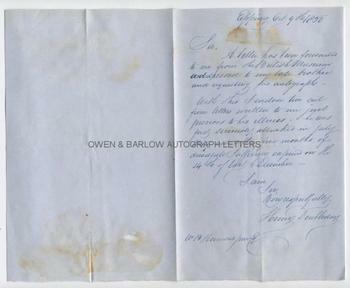 EDWARD DOUBLEDAY & HENRY DOUBLEDAY autograph Signatures and Autograph letter Signed. 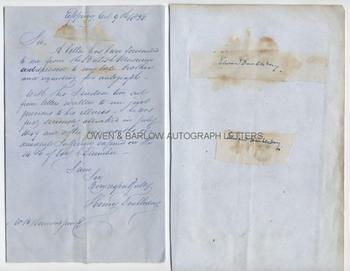 ALS of Henry Doubleday enclosing two clipped signatures of his deceased brother, Edward Doubleday. 1p plus integral blank leaf. Epping. October 9th 1850. To Wm P. Hammond, Jun. 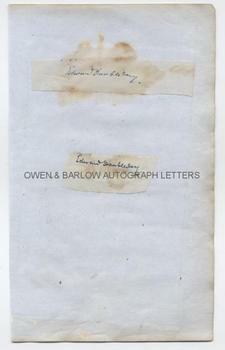 "A letter has been forwarded to me by the British Museum addressed to my late brother and requesting his autograph. With this I enclose two cut from letters written to me just before his illness - he was first seriously afflicted in July 1849 and after five months of dreadful suffering expired on the 14th of last December." 8vo. Approx 8 x 5 inches. Some mounting traces to verso of integral blank leaf and some browning from the old glue used to affix it in an album, else very good. The two clipped signatures of Edward Doubleday are affixed to an old album leaf and have staining from old glue but are else very good. The Doubleday brothers were Quakers and were both outstanding entomologists and ornithologists. Edward Doubleday spent much time in North America, where he discovered several new species of insects and is best known for his catalogue of the Lepidopterous insects in the British Museum. Henry Doubleday was the author of the first catalogue of British butterflies and moths, published between 1847 and 1850. Both brothers made discoveries of species new to science and several are named after them. 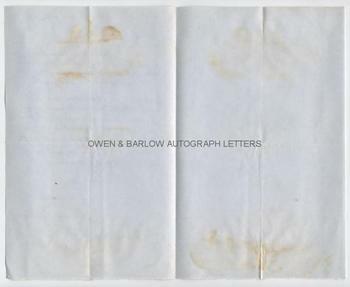 An uncommon pair of autographs and the early death of Edward makes his particularly scarce.